Sir Francis Burdett, 5th Bt (1770-1844), Parliamentary reformer. Sitter associated with 119 portraits. John Wilson Croker (1780-1857), Essayist and politician, Secretary to the Admiralty and MP for several constituencies. Sitter in 18 portraits. Charles Grey, 2nd Earl Grey (1764-1845), Prime Minister. Sitter associated with 177 portraits. Joseph Hume (1777-1855), Doctor and politician; MP for Aberdeen Burghs, Middlesex and Montrose Burghs. Sitter associated with 74 portraits. Henry Petty-Fitzmaurice, 3rd Marquess of Lansdowne (1780-1863), Whig politician; Home Secretary, Chancellor of the Exchequer and Lord President of the Council. Sitter associated with 76 portraits. John Charles Spencer, 3rd Earl Spencer (1782-1845), Whig statesman. Sitter in 63 portraits. Sir Charles Wetherell (1770-1846), Politician and lawyer. Sitter associated with 29 portraits. King William IV (1765-1837), Reigned 1830-37. Sitter associated with 145 portraits. A typical piece of reform propaganda. 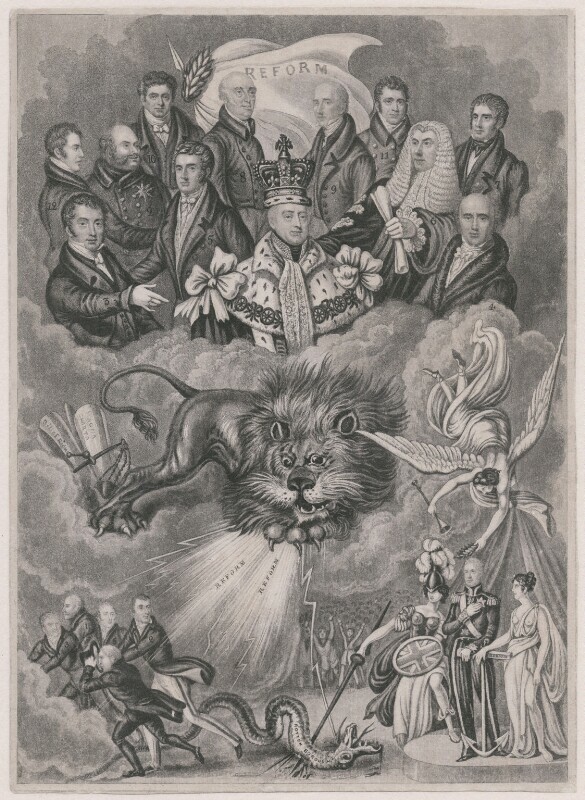 The King, William IV, and the leading Whig and Radical politicians float above on clouds of glory while below the British lion, supported by Britannia, send the Tories flying.